Montreal based artist Cedar-Eve Peters is a regular at the weekly Concordia Farmers’ Markets. Concordia University, Peters is successfully pursuing her passion as an artisan. The artist makes brightly colored bead pendant earrings and chokers, as well as t-shirts printed with her own drawings. Peters was born and raised in Toronto where she attended an arts focused high school. The artist moved to Montreal when she was 18 years old to study at Concordia where she focused on improving her skills as a painter and drawer. After graduating, she took up beadwork and has been making beaded jewelry ever since. Peters’ art is heavily influenced by vivid dreams she has as well as other artists. Her dreams often inspire different color patterns for her jewelry and the imagery that she draws and paints. The idea of a shapeshifter in Ojibwe culture often comes up in Eve’s drawings, as well the relationship between humans and animals. 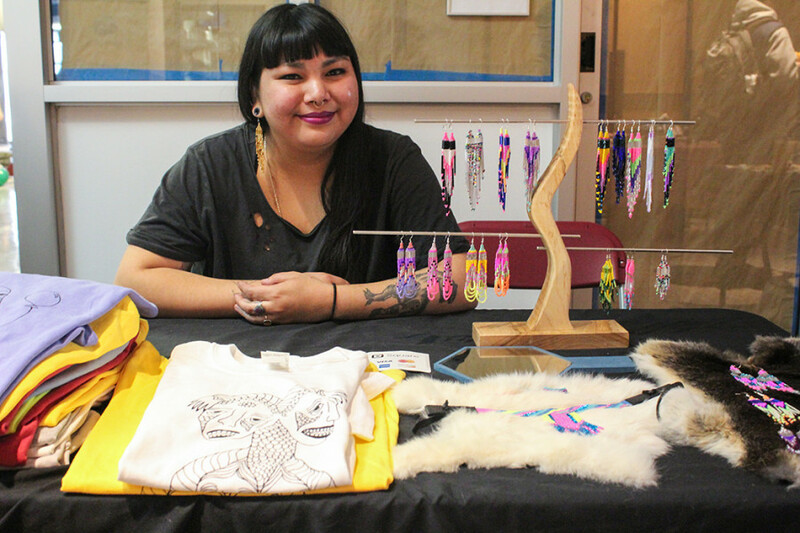 Some of Eve’s current projects include holding workshops at Concordia’s Aboriginal Student Resource Centre and making custom jewelry for clients. The McCord Museum’s boutique also carries some of her jewelry. The artist is in the sixth year of a daily self-portrait project where she takes a picture of herself with a Fujifilm Instax Mini every day and sometimes she draws on them. “I try to do something every day,” says Peters, adding that she is always creating. Peters’ art is showcased around the city and she is going to partake in the Etsy Montreal show in April. To aspiring artists, Eve says the best advice she can give is to never give up.